Even before the latest provisions for selling bogus mortgage insurance, UK retail bank fines outstripped those caused by their trader colleagues as a proportion of earnings. That makes it harder to judge the true profitability of the supposedly safer consumer business. 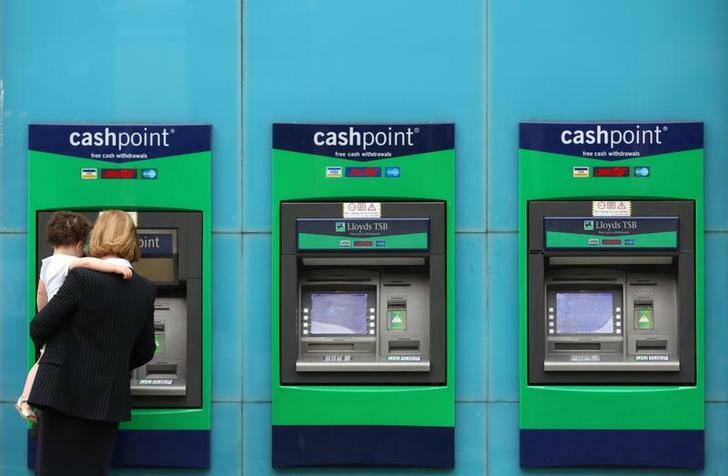 A woman uses a Lloyds Bank cash machine in Chelsea, central London. Lloyds Banking Group said on Feb. 3 it was setting aside another 1.8 billion pounds to compensate consumers mis-sold mortgage insurance. Its cumulative payment protection insurance provision is now 9.8 billion pounds. Royal Bank of Scotland said on Jan. 27 it was setting aside another 465 million pounds to compensate consumers mis-sold mortgage insurance. Its cumulative payment protection insurance provision is now 3.1 billion pounds. The Edinburgh-based bank is also setting aside 500 million pounds to compensate consumers for mis-selling interest rate hedging products (IRHP). The cumulative provision for IRHP is now 1.25 billion pounds. RBS will also provide 1.9 billion pounds to cover claims relating to mortgage-backed securities and securities-related litigation, following recent third-party litigation and regulatory decisions.